Junior Trevon Kearney rushed for 89 yards and two touchdowns as Olathe East topped Leavenworth 42-7. Sophomore Hezekiah Newman added 92 rushing yards on only six carries. Hawks quarterback Hunter Thomas completed 7 of 10 passes for 94 yards and two touchdowns. Olathe East will face KC Wyandotte in the first round of the playoffs. Olathe North earned a No. 3 seed in the playoffs by nipping Shawnee Mission Northwest 26-22. The Eagles’ Daymonn Sanchez scored with about 5 minutes left and grabbed an interception late to hold on to the win. Sanchez finished with about 145 rushing yards. Olathe North will face Blue Valley West. Topeka High out gained Highland Park by about 500 yards during a 55-0 win. Jacqquez Barksdale ran for 154 yards, while Ky Thomas rushed for 133. Quarterback Da’Vonshai Harden added 167 yards passing. The Scots offense was limited to 58 total yards. The Trojans will pay Wichita South in the first round of the playoffs. Washburn Rural improved to 4-4 with a 42-0 win over Topeka West. Jordan White ran for 127 yards and two touchdowns, while Jaylen Carter rushed for 112 yards and two touchdowns. Michael Schurig passed for 125 yards and a touchdown, and he rushed for another TD. The Junior Blues defense limited Topeka West to less than 50 yards of total offense. Washburn Rural will travel to face Garden City in the first round of the postseason. Defending champion Mill Valley evened its record at 4-4 with a 35-21 victory over Gardner-Edgerton. The Jaguars trailed 21-20 entering the fourth quarter before scoring two touchdowns to secure the victory. Brody Flaming passed for 219 yards and two touchdowns, and Cameron Young added three rushing scores for the Jaguars. Evan Rice caught seven passes for 118 yards and a score, while Logan Talley added 70 yards and a touchdown on seven receptions. Salina South defeated rival Salina Central 38-14 to win a seventh consecutive Mayor’s Cup. Casey Lanoue rushed for 125 yards and a pair of touchdowns to lead the Cougars. Salina Central, once the standard for Class 5A football, lost its 17th consecutive game. Great Bend used a big rushing night and a strong defensive performance to win at Garden City, 20-7. Junior quarterback Koy Brack rushed for 137 yards and a score and sophomore Dalton Miller added 122 yards and a touchdown as the Panthers churned out 275 yards rushing. Brack also connected with Miller for anther Panther score. Great Bend held Garden City under 175 yards of total offense and only three yards per rush attempt. Sawyer Slayden returned the opening kickoff 90 yards for a touchdown as Emporia upset Shawnee Heights 19-14. The loss knocked the T-Birds from the third seed on the east side of Class 5A to No. 5. The Spartans rushed for 219 yards in the game led by Gabe Galindo’s 87 yards and Jace Stewart’s 71 yards and a touchdown. Sophomore Beau Baumgardner also rushed for a score for Emporia. Nolan Ford rushed for 303 yards and two touchdowns on 24 carries as Basehor-Linwood crushed Atchison 34-0. It was the Bobcats’ sixth shutout of the season. They improved to 7-1 overall and 2-0 in their district. Basehor-Linwood clinched a spot in the playoffs and will play Tonganoxie for the district championship. Labette County’s winning streak improved to six games with a 36-0 win over Chanute. Junior quarterback Easton Dean passed for 212 yards and three touchdowns. Senior T.J. Mayhue ran for 114 yards and a touchdown. Senior Owyn Back caught five passes for 118 yards and two TDs. The Grizzlies are now 7-1 after winning only eight games from 2013-15. Labette County already clinched a postseason berth and will win the district title with a victory against Coffeyville. Fort Scott clinched a district title with a 27-26 victory against Paola after Zarek Fewell denied a two-point conversion with 26 seconds left. On offense, Fewell rushed for 189 yards and two touchdowns on 22 carries. Colton Gleghorn led Paola with 190 yards and two touchdowns on 39 attempts. Hays defeated Abilene 36-0 to keep its postseason hopes alive. The Indians snapped a four-game losing streak and will face Wamego with a playoff spot on the line. Last year, Wamego topped Hays 30-13 to keep the Indians out of the playoffs. Nickerson scored 27 fourth-quarter points to defeat Wichita Collegiate, 48-14. 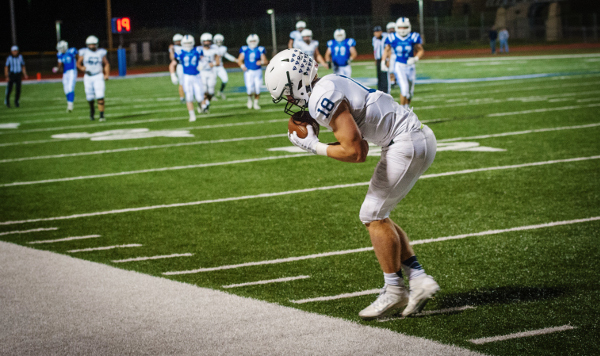 Tanner Schrag and Peyton Kuhns rushed for touchdowns in the final quarter and Schrag returned a Spartan fumble 85 yards for another score as the Panthers poured it on in the final quarter. Nickerson rushed for nearly 500 yards in picking up the second win over Collegiate in school history. Wichita Trinity outscored Clearwater 25-0 in the fourth quarter to prevail 45-32 in a key district game. Quarterback Sam Hardin passed for 299 yards and four touchdowns to lead the Knights. Hardin also rushed for 87 yards and three more scores. Caden Williams continued his standout senior season with 12 catches for 102 yards and a score. Williams now has 70 receptions for 1,055 yards and 18 touchdowns on the year. Wichita Trinity needs to win at Wichita Collegiate this week to reach the playoffs for the first time in school history. Frontenac controlled the entire game against Columbus in pulling off a 20-8 victory at home. The Raiders led 14-0 until late in the third quarter when Columbus RB Keenan Stanley caught a short swing pass for a touchdown. Trailing 14-8, the Titans got the ball back, but QB Ridge Smith was intercepted by Frontenac’s Brendan Ishimura. The Raiders iced the game on the next play as Jake Wilbert went 60-yards for a score. Connor Jeffers rushed for 362 yards and four touchdowns as Burlington picked up a key district win at Girard, 44-28. The Wildcats got the ball back late in the second quarter with a 22-15 lead and Jeffers broke a long touchdown run to provide separation, 28-15 at halftime. Burlington rushed for 463 yards in the game and did not complete a pass. Thomas More Prep defeated Russell, 46-6, on Senior Night and improved its win total for a fourth straight season. The Monarchs (3-5) will travel to Norton (6-2) next week for a District 14 playoff berth. TMP has not made the playoffs since 2002. Gavin Schumacher had 19 carries for 150 yards, caught two passes for 109 yards and recovered a blocked punt in the end zone for a score. Schumacher caught a 95-yard scoring pass from David McFarland to open the scoring. McFarland threw for 443 yards and five touchdown passes, including 51, seven, 37, and 12 yards. TMP won its first home game since 2011. Riley County defeated Beloit, 12-0, and moved to 7-1. The Falcons went 0 of 1 passing and rushed 52 times for 253 yards and two scores. Junior Mikey Waggoner had 25 carries for 136 yards and a touchdown, while senior Tyler Halstead finished with 23 carries for 113 yards and a touchdown. Riley County has won its most games since 2011 behind an offense that has averaged 336 rushing yards a contest. Council Grove defeated Mission Valley, 18-14. Jacob Ziegenhirt and Ty Salas had big defensive performances. Ziegenhirt had 11 tackles, two sacks and a forced fumble. Salas had eight stops, two TFLs and a pick-six. CG led 6-0 at halftime after Salas had its INT touchdown return from five yards out. The Braves had nearly 250 rushing yards, including Carter Finch had 153 rushing yards. Maur Hill-Mount Academy outscored Maranatha Academy 39-0 in the middle quarters of a 51-12 district win on Friday. The Junior Ravens were led by sophomore quarterback Jack Caudle who passed for 225 yards and two scores. Caudle’s classmate Dylan Smith rushed for 108 yards and three scores. Maranatha was held to negative rushing yards in the game, but sophomore Nathan Burdette passed for 143 yards and a score for the Eagles. Elkhart held off rival Meade, 18-15, in a key game that will likely decide the two District 8 playoff berths. The Wildcats trailed 7-6 after the end of the first quarter but tallied a pair of unanswered scores in the next two quarters. Junior Lane Whisennand completed 7 of 11 passes for 134 yards with a touchdown. He rushed 30 times for 219 yards and two scores. Meade senior Devon Waters had 12 carries for 114 yards and a score. Elkhart ended a two-game losing streak versus the Buffs. Sedgwick locked up another district crown and playoff berth with a 43-0 victory against Remington. Neal Bever picked off two passes for 19 in the last 18 contests. He has three pick-sixes this year. Junior quarterback Hooper Schroeder finished 16 of 26 passing for 292 yards and three scores. Sophomore Kale Schroeder had four receptions for 117 yards and a kickoff return score to open the contest. Senior Brayden Francis delivered his 30th receiving touchdown in his last 18 games. The Cardinals, which switched defensive schemes in midseason, held the Broncos to under 100 yards in total offense. Sedgwick led 37-0 at halftime. The Cardinals have made the playoffs in eight of the last nine seasons, including nearing a seventh straight undefeated district crown. Sedgwick is 4-4 overall, 3-0 in District 5. La Crosse has won six in a row after a 43-23 win against Oakley and secured a playoff berth for the second straight season. The Leopards had 22 fourth-quarter points. Hunter Morgan completed 11 of 19 passes for 168 yards with two touchdowns against one interception. Morgan, Brown and Christian Suppes combined for four rushing touchdowns. Olpe defeated Northern Heights, 44-6, and permitted just 124 yards of offense to set up a key district contest versus unbeaten Lyndon. Freshman Kynden Robert opened the game on scoring runs of eight and three yards. He added a 78-yard scoring run in the second half. Garrett Pimple caught a 33-yard touchdown pass and had a 40-yard pick-six. West Elk clinched competitive District 1 with a 62-28 victory against Marmaton Valley. Senior quarterback Cade Miller led the Patriots with 5 of 13 passing for 149 yards with a 2/0 TD/INT ratio. He rushed 14 times for 160 yards and five scores. Junior William Silvey had two catches for 100 yards, both for scores. Atwood-Rawlins County defeated WaKeeney-Trego, 46-0, in District 8 play. The one-loss Bulldogs do not control their own destiny in the district due Hoxie and St. Francis holding the tiebreaking points margin. Senior Braden Leitner had four rushing touchdowns, and Maverick Green passed for two scores. Victoria rolled over Lincoln, 52-0, on Senior Night. The 6-2 Knights will play Solomon (5-3) to likely decide the runner-up spot in District 4. The runner-up will head to No. 1-ranked Burlingame in the first round. Cooper Windholz passed for three touchdowns to three different receivers. Collin Kisner had four rushes for 82 yards and a score. Logan-Palco has just six losses in the last three years but no playoff berths. The Trojans defeated Solomon, 64-16, after the Gorillas kept them out of the playoffs last season. Senior David Thompson had 20 carries for 218 yards and two touchdowns. Senior quarterback Riley Allen finished with eight carries for 114 yards and four scores and completed 2 of 3 passes for 81 yards with a pair of TDs. L-P is 7-2, 7-2 and 6-2 in the last three years. Thompson now has 1,160 rushing yards this season, his third straight year with more than 1,100 yards. He has 73 rushing TDs and 4,577 yards in his career. Little River beat Ellinwood, 66-18, and moved to 6-2. The Redskins had 24 points in the first quarter and 30 in the third. Hunter Thomas delivered 209 rushing yards and three scores. Peyton Harvey delivered a game-high 10 tackles. Canton-Galva moved to 4-4 and is a victory away from its first winning season since 2014 after a 46-0 win against Goessel. The Eagles led 24-0 after the first quarter and received 14 carries for 196 yards and five scores. Canton-Galva outgained Goessel, 314-18. Northern Valley clinched its first playoff berth since 2005 and earned the District 5 title with a 66-14 win against Stockton. The Huskies have captured four straight wins and permitted just 20 points in those contests. Senior Caden Kinderknecht had 20 carries for 253 yards and six scores. Caden Bach and Nick Stutsman combined for 28 carries for 190 yards and three touchdowns. Caldwell stayed undefeated with a 69-6 win against South Haven and set up a showdown versus 8-0 Hutchinson Central Christian. The Bluejays outgained South Haven, 204-86 and picked off three passes. Corbin Rice completed 4 of 6 passes for 79 yards, all for four scores. The Bluejays threw for six touchdowns overall. Caldwell led 49-0 at the end of the first quarter. Hartford lost 36-34 to Norwich despite a big performance from Hartford senior running back Justice Kemmerer. He had 284 yards and five touchdowns in the loss. Norwich led 30-20 at halftime. Axtell improved to 6-2 and clinched a playoff berth with a 62-12 victory over Blue Valley Randolph. Quarterback Quinn Buessing passed for 144 yards and two touchdowns in the game and added 88 rushing yards and a pair of scores. Axtell will take on No. 1 Hanover this week to decide the District 3 championship. Golden Plains defeated Western Plains 35-0 in the first round of the 6-Man playoffs. The Bulldogs led 35-0 in the first quarter when the game was cut short due to Western Plains suffering a pair of injuries. The Bobcats only started the game with seven healthy players and could not finish beyond that point. Golden Plains advances to the 6-Man semifinals where they will take on No. 2 seed Cheylin. Defending 6-Man champion Weskan kept their hopes for repeating alive with a 36-34 first-round victory over Wheatland-Grinnell. The Coyotes will not take on regular-season champion Pawnee Heights in the semifinals this week. Wheatland-Grinnell was led by sophomore Kyler Haffner who passed for 164 yards and three touchdowns in the loss.